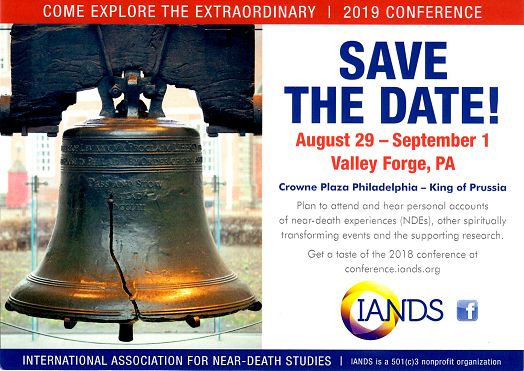 20 years after the first formal gathering of near-death researchers, will review current research trends and findings in the field of near-death studies. We will discuss the implications of new information from physiological, psychological, and sociological research into NDEs, and the models on which they are based. Finally, we will explore why the choice of one's explanatory model makes a difference, and extrapolate to future directions in research and what they may teach us about humanity's role in the universe. After nineteen years of interviewing near-death survivors, and with a research base numbering in the thousands, PMH Atwater was the first to recognize and identify cycles or phases to the integration process after one has a near-death experience. She originally isolated three such phases, but as her work progressed she noticed a fourth one--and a time of "Unspoken Grief." because of the importance of the aftereffects and the fact that in the majority of cases such changes can become permanent, it is vital that more attention be given to the universal pattern of how the aftereffects tend to impact on an individual's life--especially during the fourth phase when a second drop and a second shift occur and varied degrees of grief and/or depression can be overwhelming. A goal in presenting this material is to engage the audience in lively dialogue. The question of whether or not cases of the NDE can be identified across the English-speaking literary tradition goes to the heart of a major controversy in language study. Scholars are debating whether there is such a thing as an individual subject who can have personal experiences that are not entirely constructed by language and social context. While common sense might suggest that the self is more than a social construct and experience is more than language, the search is on for something resembling a "universal experience" that is discovered that is discovered through language and social behavior, yet transcends both. Since Steve Straight's excellent article on Katherine Anne Porter's short story, "Pale Horse, pale Rider" in Anabiosis, very little seems to have been published concerning the NDE in literature. This session examines three literary artifacts in the light of Dr. Raymond Moody's clinical model of the NDE leading to the recovery of both the features and the effects of NDE in all three artifacts. The implications of this research in the debate among language scholars will be discussed. In this session, Jo Ann Marnie will discuss methods that can be used to integrate the effects an NDE into one's life. A "whole body" approach, considering body, mind and spirit will be considered. Methods for balancing the body and mind, to help the experiencer back to "conscious reality" will be included as well as ways for non-experiencers to understand the distress of experiencers in what they say has occurred. "Less then Positive" NDEs (termed "inverted" by Kenneth Ring and "distressing" by Greyson and Bush) are significantly under-reported. Dr. Rommer's research suggests that at least 13.9% interviewed (just over 200 thus far) have had an LTP. Her findings concur with Greyson and Bush concerning the three types of LTP's. In this session, Dr Rommer will present specific examples of each with particular attention to the subsequent changes in the person as a result of the LTP. Communicating a profound experience such as an NDE confounds most experiencers because of lack of terminology, supportive environment and a non-judgmental listener. Internalizing an NDE is difficult and sometimes impossible for the experiencer. Encouraging a person to tell his/her own story can be taught using methods such as Ericksonian guided imagery. Programs such as the Past Is Prologue (which employ learning stories to illustrate or point up problem areas), use storytelling to create a safe place to introduce a "dangerous" subject area. Storytelling through time, has been used to communicate learning and integration of life events in a way other current techniques cannot touch. In this session, Elizabeth Langston, a psychologist and licensed professional counselor will present summary data gathered from cases in her own practice regarding healing the traumas of experiencers plus an interview process she uses to help promote the beginning of the storytelling, and to set the stage for integrating the storytelling into the counseling session. Most individuals do not consider stillbirths or miscarriages to be the equivalent of a death because they believe the spirit or life force enters the body with the first breath of air. therefore a stillbirth is not a child, but an unfortunate, even tragic, failure to have a child. This sense of failure, or not having a child, makes it very difficult for may parents to complete their grieving as they sincerely feel that they have lost a child. Harold Widdison will share case examples illustrative of encounters with those who were stillborn or miscarried and the messages they wanted their mothers to receive. The relationships between Near-Death Experiencers and health care professionals has often been a problematic one and sometimes a very hopeful one. In this presentation, Dr. Kircher will discuss the historical perspective as well as the ways that the relationship has been changing over the past ten years and some practical aspects about approaching health care professional concerning NDEs. Dr. Kircher is a Family Practice physician who had a Near-Death Experience as a young child. She has worked as a hospice physician, a clinical instructor at Baylor College of Medicine, a NDE support group facilitator and has authored the book Love is the Link (opens in a new window). In the summer of 1995 we presented some of our research at the IANDS conference at the University of Hartford based on the following: Several years ago Sarah had encounters with some our children before they were born. Encounters occurred through dreams, hearing a noise, sensing a presence, seeing a presence, etc. She initially shared her prebirth encounters (PBEs) only with immediate family, but wondered if other people had similar experiences. She initiated a quest and soon located others who had been or heard from their future children before they were born, or even before conception. Brent joined Sarah in her research. A fundamental principle of behavioral and natural scientists is reductionism: all mental phenomena can be reduced to a physical basis. Phenomena which have no physical basis cannot really exist. For most scientists this rules out "transpersonal", "New Age", spiritual or noetic, religious and related phenomena, all of which maintain strongly antireductionist positions. Thus believers in NDEs have an uphill battle to stay scientifically afloat. Ring (1991) argued that NDEs act as compensatory gifts helping individuals cope with and understand life's difficulties. He saw NDEs as conferring "amazing grace" on individuals whose lives were spinning out of control toward self-destruction. Expanding on Ring's contention that NDEs can be seen as healing gifts, this session presents evidence of seven categorical situations where participating in or knowledge or NDEs and nearing-death awareness experiences serve as healing agents in facing one's own death or the death of significant others. NDEs and nearing-awareness experiences seem to fee persons from paralyzing death anxiety and, consequently, allow them to focus on additional ways to help each other face dying and grieving. In 1977 we learned about remarkable experiences that often occur after the death of a loved one. Though they have been reported though history, no one had ever given them a name or studied them systematically. We named these experiences "After-Death Communications." We began our research in 1988 by interviewing people who replied "Yes" to our question, "Have you been contacted by a loved one who has died?" Children of any age--even babies making their journey through the birth canal--can die, have a near-death experience, and live to speak of it as soon as they have language and can find willing listeners. How many children cross the borderland into the bright worlds on the other side of death, no one knows; but Melvin Morse, MD, in his ground breaking research on children's near-death experiences estimated that incident rates may be as high as 75%, more than anyone ever imagined. Missing from research, however, is an in depth study of these children and what they experience as sifted through their own uniquely special perspective. PMH Atwater has spoken before of her work with children, mentioning it in all three of her previous works on near-death and transformative states of consciousness. With this talk, though, she will focus on her next book, "Second Birth", and what appears to really happen when children have a near-death experience. No matter what you personally think happens in an NDE, its effects on the experiencer are profound. In this session, the basic NDE will be discussed, what it is, how it occurs, typical experiencer reactions to be aware of, and how to handle the experiencer with compassion and understanding. 20 Years of Near-Death Studies: Where Do We Go From Here? Dr. Moody began his research into NDEs over twenty years ago. Since then he has written seven books, including Life After Life (opens in a new window), which has sold over 10 million copies world wide. He is credited with coining the phrase "near-death experience," a concept on which he is a leading expert. In this presentation, Dr. Moody will be looking back on the years since he first entered the field and reflecting on where the research has taken us all.